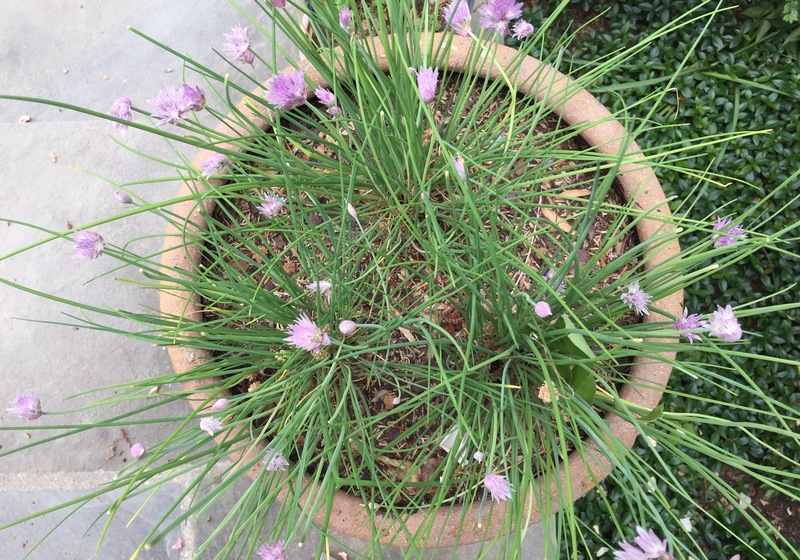 I’ve been on the road and came home to a blooming plant and I thought I have to tell EVERYONE to make chive blossom vinegar. Listen up. Make this pretty vinegar today. Today! 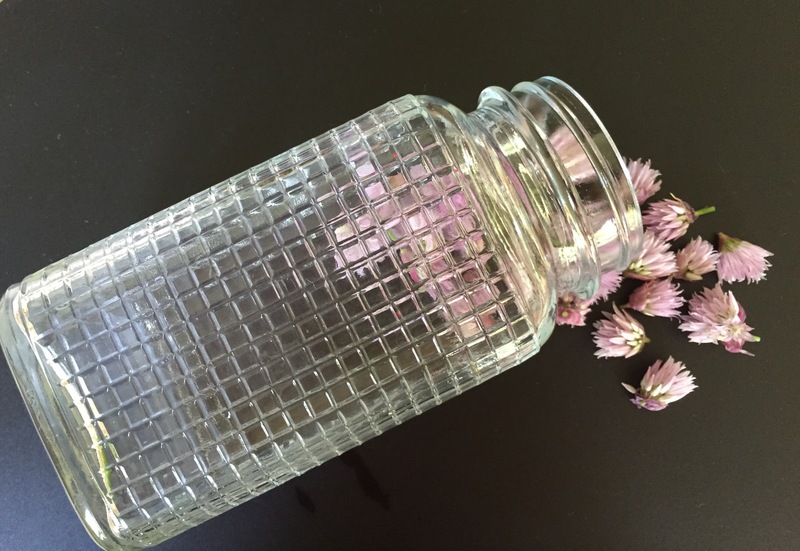 Because chive blossoms only come once a year and this little jar of goodness will take awhile to develop and you will want it. You will want it on spring garden greens, the tender mesclun, the bright Bibb lettuce heads. All those good greens are coming or are already at your farmers market. For those of us in the mid-Atlantic and further South, the tender greens can’t take the heat, so they’re not around for long. Just like those chive blossoms. With all the travel, I’m feeling a little frazzled and hectic. So, these chive blossom moments remind me to stop, inhale, recognize passing time. (How is it May already?) I make this delicate vinegar to remind me of this very moment when summer is hot and unrelenting, this moment when the evenings are still cool and the lettuces haven’t bolted. I’m heading out again this Saturday, May16. 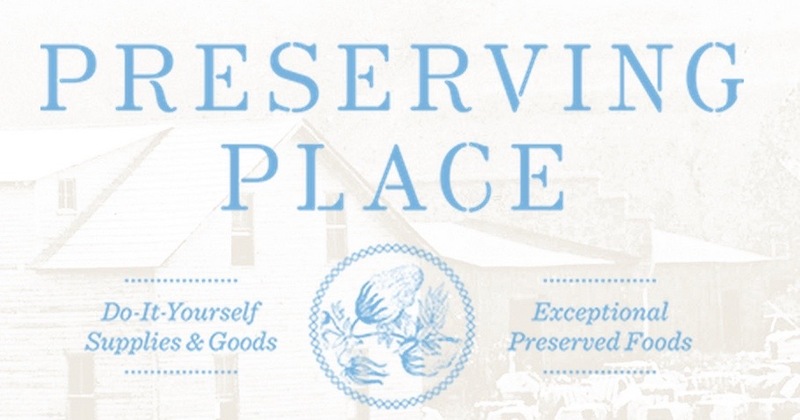 From 1-4pm I’ll be at Preserving Place in Atlanta. The fun-loving owner, Martha, is hosting a preserving party. I’ll be demonstrating two types of strawberry jam, talking about fruit selection, getting the proper gel, and making what Martha calls Righteous Jam, without pectin. We’ll cover waterbath canning, make homemade butter and bake up some biscuits. We’re even planning to put homemade bacon in the smoker, all for a delicious DIY breakfast. There’s Cathead Vodka Bloody Marys, too. That’s right. So RSVP! The event is free but we want to make sure to have enough of everything to go around. 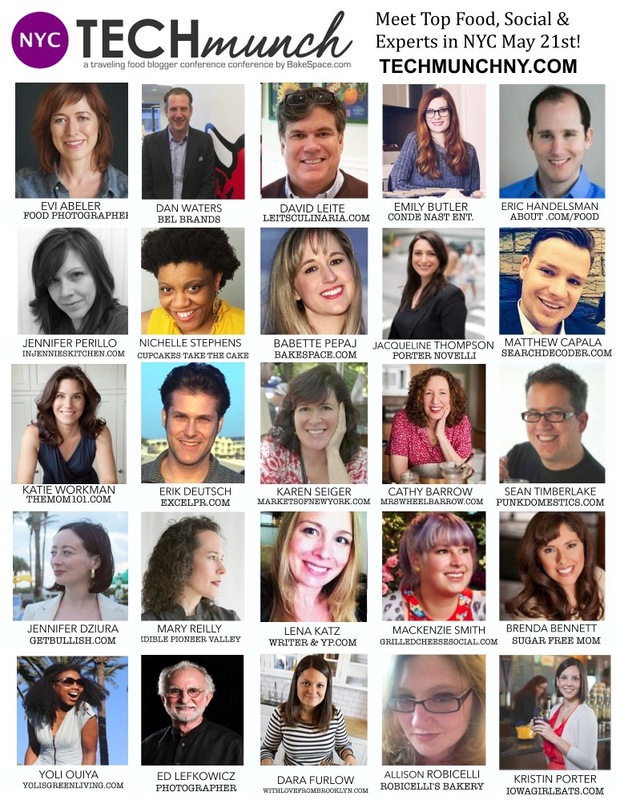 Next Thursday, 5/21, come to NYC and TechMUNCH where I’ll be talking about the Living the Dream – The Path from Blog to Book. This all day event is sure to be a great day of learning and community building. Everything BakeSpace’s Babette Papej puts together is sensational. Just look at the lineup. (I’m over the moon about being part of this group! What a room-full of smarts, right?) There is still time to register and BakeSpace is giving away buddy passes, too. In the meantime, make the vinegar. It takes no time at all to put a little bit of early summer in a jar. Pluck the blossoms from the top of the chives. Rinse to remove any little bugs. Pop the blossoms in a jar. Add white wine vinegar, whatever you have. I had inexpensive champagne vinegar. Place a cloth over the top of the jar, letting air in and keeping bugs out. Put the jar in the back of a dark cupboard or closet. Take it out in 2 weeks. Taste it. For a more pronounced chive flavor, leave it steeping for up to one month. 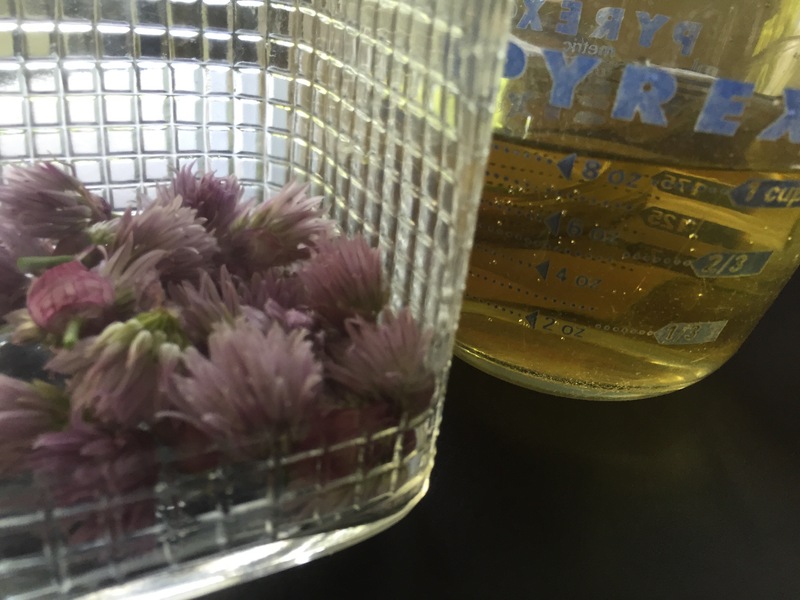 When the flavor makes you happy, strain the vinegar through a fine sieve and place the jar in the refrigerator to help retain the pretty pale chive purple color. The vinegar will never spoil if you keep it in the refrigerator. But you will run out. If you’re lucky, that will be next year, around this time. Sounds great! I have a ton of blossoms. How long will it keep once steeped? Hi Wendy, The vinegar will keep forever. The color will stay brighter if you store it in the refrigerator. thanks! and when you say put a cloth over the top of the jar, do you mean between the jar and the seal or over top of the whole thing? I just made a little edit in the recipe. Thanks for asking, Wendy. Just cover with a cloth so the air can get in, but any bugs can’t! Don’t put a lid on the jar until it’s been strained and it goes in the ‘fridge. Oh yes…….do make this! I do it every year. Great for salads and just a week ago I made a dressing with the last of it and marinated chicken legs then baked and poured the hot dressing over my salad. Can’t wait to get more blossoms this year……..N.H. little cool yet,but,soon. Leaving for Columbia and Nicaragua tomorrow and have NO TIME do to this but I must! I have all those pretty chive blossoms. Now that I know about this recipe, I can’t bear to waste them. I just put on a headlamp and went out and picked a couple of cups worth of blossoms. no time like NOW!!! This recipe works well with other herb blossoms. I’ve made it with basil blossoms. Tastes great and beautiful color. This recipe hit my inbox at just the perfect time. After my folks gave up their community garden plot last year I inherited their chive clump and moved it over here to Ohio. 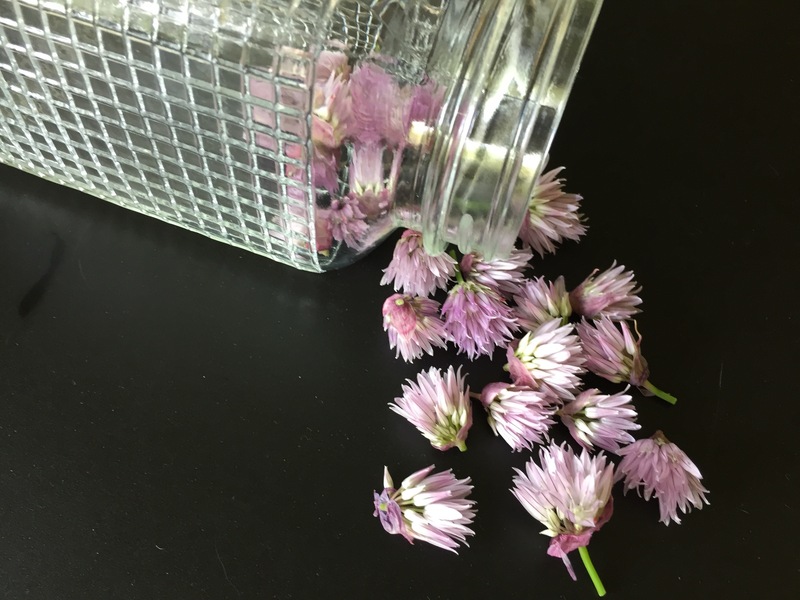 This is my first year with chive blossoms, so I snipped them all off and have a jar steeping in the pantry right now. I’ve got a few extra blossoms, and some leftover cooked potatoes, and I think a focaccia is speaking to me next. Thanks for a wonderful idea, and enjoy the upcoming events! This is a favourite at our house. I use white wine vinegar and heat it gently until not quite at a boil. Then I dump it over an 8 cup pyrex measuring cup FULL of blossoms and let it steep half a day. Strain and use! Gets better with age! Experiment with different herbs as well. Just fill that measuring cup .. I have used basil, savoury, sage, thyme, oregano, even flowers! Nasturtium vinegar is a peppery pleasure! I might have put in more blossoms than called for but they were already cut so what the heck. Does this really need air or can (oiy) I just use the regular canning lid? Use a alternative lid if you can. The vinegar will corrode the metal of regular canning lids. Or put waxed paper over jar mouth and the screw on lid! I have two varieties of chives in the garden. The first variety bloomed and went to seed long ago. The second variety just started blooming. It looks nothing like your chive flower. The very tall flower stalk is topped by a blossom that bends down and dangles similar to a seed-laden sunflower. Unlike a sunflower, it’s made up of multiple little white flowers that are not straw-like. Would these work? Do they need to be fully open? I don’t know the variety but bought it at a native plant sale in Alexandria, Virginia. Perhaps garlic chives? Are the leaves flatter..more like blades of grass than round? I have both ..and they are both delicious!